We are pleased to inform that, there will be a seminar on Where to Put Your Money In 2016 on 12 March, 2016 (Saturday) from 9.00am – 5.00pm. 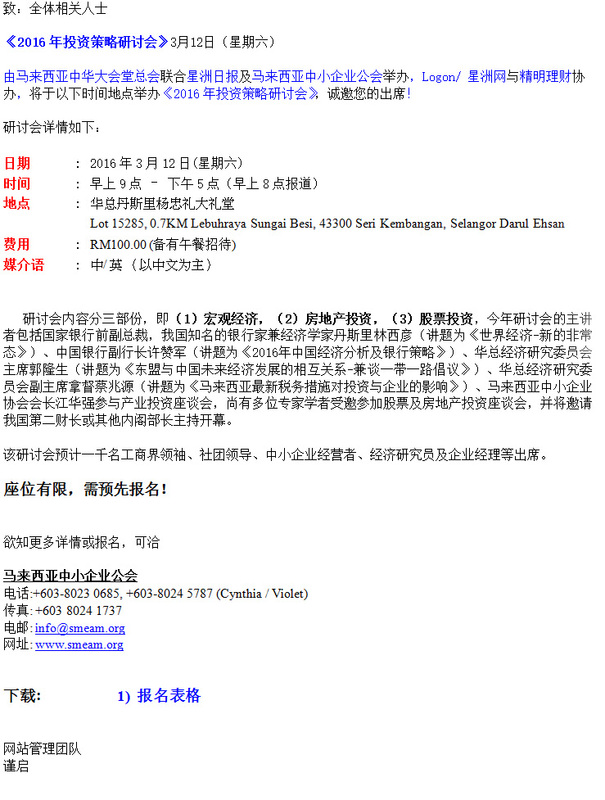 This seminar is jointly organized by The Federation of Chinese Associations Malaysia, Sin Chew Daily, and SME Association of Malaysia and co-organized by Logon (MCIL Multimedia Sdn Bhd) and Money Compass. Datuk Chua Tia Guan, Vice-Chairman of the Federation of Chinese Associations Malaysia Economic Research Committee is invited as one of the keynote speaker for the event.